Reading and share top 8 famous quotes and sayings about Casting Shadows by famous authors and people. 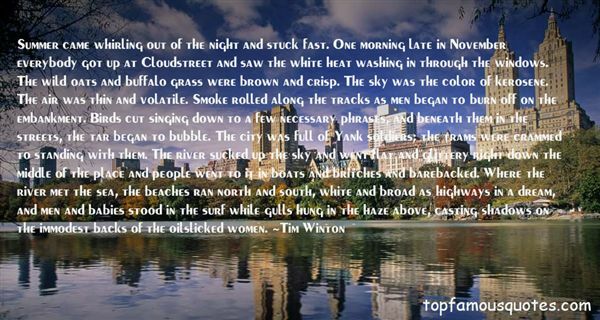 Browse top 8 famous quotes and sayings about Casting Shadows by most favorite authors. 1. "Maybe." I shrug. "But what I meant was, can't you use the makeup to cover it? "Miles rolls his eyes and scowls. "Oh, so I can sport a huge flesh-colored beacon instead? Would you look at this thing? There's no disguising it. It's got it's own DNA! It's casting shadows!" 2. "When we're anxious, disconnected, vulnerable, alone, and feeling helpless, the booze and food and work and endless hours online feel like comfort, but in reality they're only casting their long shadows over our lives." 3. "I have been casting shadows all my life without caring about how deeply they stain my soul." 4. "Out there people are working and arguing and laughing, living their beautiful, terrible lives, falling in love and having babies and being bored out of their skulls and feeling depressed, then being consoled by some little thing like watching the patterns the light makes through the leaves of trees, casting shadows on the sidewalks.I remember the line from that poem now.Downward to darkness, on extended wings." 5. "PRELIMINARY EXERCISE:What does a turbine veil? a bird avail what chord?I heard a bird whir no word, felta turbine shadow turning from the floods of timeelectric currents the darkness stirrd,and trees in blaze of light arosecasting shadows of speech, seductive, musical, abroad.It was a single tree. It was a word of many trees that filld the vale.It was a store of the unspoken in the birdthat whirrd the air, that every occasion of the word overawed." 6. "At night I lay awake, her likeness casting dark shadows across my soul and senses, and my stomach throbbing away. I imagined her arms around me, lulling me into a phantom bliss, so frustrating, so unreal." 7. "Summer came whirling out of the night and stuck fast. One morning late in November everybody got up at Cloudstreet and saw the white heat washing in through the windows. The wild oats and buffalo grass were brown and crisp. The sky was the color of kerosene. The air was thin and volatile. Smoke rolled along the tracks as men began to burn off on the embankment. Birds cut singing down to a few necessary phrases, and beneath them in the streets, the tar began to bubble. The city was full of Yank soldiers; the trams were crammed to standing with them. The river sucked up the sky and went flat and glittery right down the middle of the place and people went to it in boats and britches and barebacked. Where the river met the sea, the beaches ran north and south, white and broad as highways in a dream, and men and babies stood in the surf while gulls hung in the haze above, casting shadows on the immodest backs of the oilslicked women." 8. 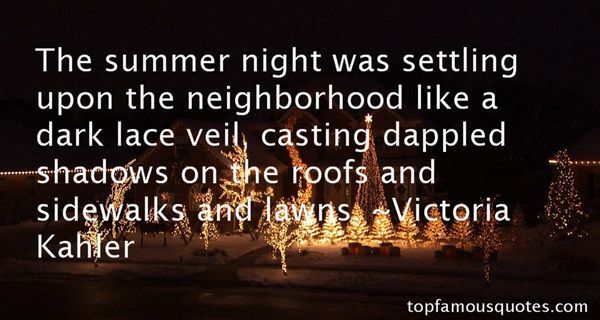 "The summer night was settling upon the neighborhood like a dark lace veil, casting dappled shadows on the roofs and sidewalks and lawns." This is the proper moment to maximize your favorable occasion and actualize your favorable influence."